West Papua’s natural resources are being exploited by extractive industries, especially around Merauke. When it was launched in August 2010, the MIFEE mega-project was described as an initiative to meet the world’s food needs, a response to the world food crisis. As well as this, there are the current global concerns that the diminishing reserves of fossil fuel globally are bringing about a energy crisis. With an area of over 1.2 million hectare earmarked for the project, the Merauke Regency Government hoped to turn Merauke into a centre of urban agriculture, agribusiness and agrotourism. Many companies welcomed the government’s offer and saw it as a great opportunity to expand their operations in eastern Indonesia. Merauke Regency’s Investment Planning Board (Badan Perencanaan Investasi Daerah or BAPINDA) has recorded that 46 companes have obtained permits, and some of which have already commenced operations. (data from Bapinda, September 2012). to that company as far as we know], PT Central Cipta Murdaya (CCM), PT Agriprima Cipta Persada, PT Hardaya Sawit Papua and PT Berkat Citra Abadi (Korindo Group). Hundreds of thousands of hectares of indigenous people’s land will be appropriated, the forest destroyed and replaced with large-scale oil palm plantations. of which clans own or have rights over which land, insufficient payment of compensation and deception and manipulation of data. As a result the clans and tribes living along the Maro and Bian rivers have been dispossessed of their customary lands. On the 31st July2011, 13 civil society organisations signed and delivered a letter to the UN Committee on the Elimination of Racial Discriminaton (CERD), accusing the MIFEE Mega-Project of bringing about the destruction of indigenous societies in Papua and in Merauke in particular. A response to this letter was received from Anwar Kemal, Chairperson of the Committee on the Elimnation of Racial Discrimination, on the 2nd September 2011. It requested that the Indonesian Government, which became a party to the International Convention on the Elimination of All Forms of Racial Discrimination 1965 when it ratified Law number 29 of 1999, to give a swift response and clarification before 31st January 2012. Until now, the government has still not given its response. The government is showing neglect and disregard and it’s not for the first time – previously in 2007 they had planned to fell the forest along the whole Indonesia-Malaysia border for oil palm plantations. 1. Companies must be responsible and make restorations, as well as giving compensation to people living along the Bian River as far as Kaptel and the Maro River for the environmental damage and pollution caused by oil palm plantation operations. 2. 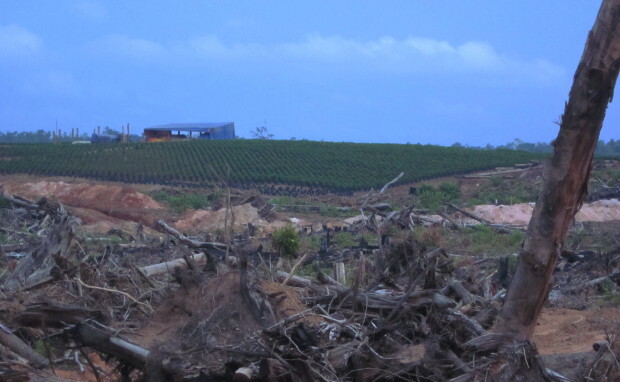 The government must carry out a review and evaluation of the permits which have been given to oil palm plantations on indigenous land belonging to the clans and tribes which live in Merauke Regency, revoke and cancel location permits and withdraw all commercial cultivation rights from customary lands in Merauke Regency. 3. The government must stop issuing new permits in Merauke Regency before all current problems are resolved, as well as repairing the damage that has already been done to the various communities. 4. As a party which has ratified the International Convention on the Elimination of All Forms of Racial Discrimination 1965 through Law number 29 of 1999, the government must immediately respond to the Chairperson of the Committee on the Elimination of Racial Discrimination Anwar Kemal’s letter dated 2nd September 2011 (which was a response to the concerns raised to the UN CERD on 31st July 2011).